Staggering, isn't it? 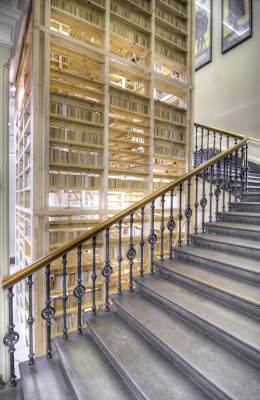 Called Ark, this bookshelf apartment houses about 6,000 books on three stories. 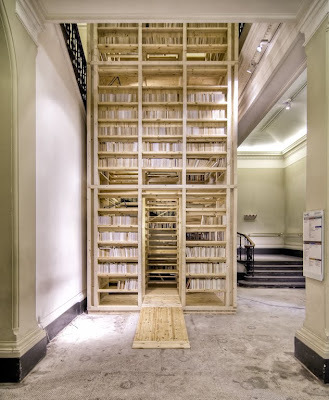 The creation of Rintala Eggertson Architects, this space is actually part of the Architects Build Small Spaces exhibit in London's Victoria & Albert Museum. If you're lucky enough to be in the neighborhood, it'll be on display through August - if you're not, you can take a video tour of it after the jump. "This free-standing wooden tower re-evaluates the concept of the 'archive'. ...The project investigates how small spaces can focus our energies and thoughts in moments of study, meditation and self-reflection. Accessed via a spiral staircase, the tower invites visitors to explore the structure, have a leisurely browse through the books, and select a private reading chamber in which to enjoy their selection." You can read more about the entire exhibit here.